Every Cell in Every Well ! The Celigo® S Cell Cytometer is an easy-to-use high speed multi-channel brightfield and fluorescence imaging cytometer for high throughput whole well cellular image acquisition and processing of multi-well plates. Advansta's new FLASHBlot Transfer Buffer allows scientists to achieve increased sensitivity in their Western blots. The buffer provides increased transfer efficiency of all proteins, including large molecular weight proteins that are notoriously difficult to transfer completely. It also increases protein retention on the membrane, so it's easier to detect low-abundance proteins. 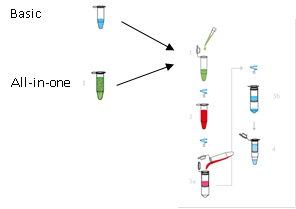 The innuCONVERT Bisulfite Kits enable users to detect methylated vs. non-methylated cytosines: whilst non-methylated cytosines are chemically converted by bisulfite treatment into uracil, methylated cyctosines remain unmodified.